Exponential demand and sales of L.O.L. Surprise collectible dolls and Hatchimals Collectibles is contributing to the rising revenues in the global toys market. CHICAGO, IL, UNITED STATES, September 26, 2018 /EINPresswire.com/ — Arizton’s recent market research report on the global toy market identifies Lego Group, Mattel, Hasbro, and Bandai Namco as the leading vendors that are likely to dominate the market during the forecast period. This research report provides a detailed analysis of market segmentation by category (infant and preschool, dolls, games & puzzles, construction, outdoor & sports, and others), by age group (0-3 years, 3-5 years, 5-12 years, and 12-18 years), by distribution channel (online and retail), and by geography (APAC, Europe, North America, Latin America, and MEA). Increasing demand for games such as Yahtzee, Bunco, Shut the Box, and Lair’s Dice and for card games such as Yu-Gi-Oh, Uno, Spades, and Poker,and Taboo will add to the revenues of the global toy market. The market is expected to reach values of more than $120 billion by 2023, growing at a CAGR of around 4% during 2017-2023. Request for a sample today! The global toy market is divided into four major segments that consist of category, age group, distribution channels, and geography. The global toy market by category is classified into infant and preschool, dolls, games & puzzles, construction, outdoor & sports, and others. Games and puzzle segment dominated 1/6th of total market share in 2017, growing at a CAGR of around 9% during the forecast period. The extensive use of this board games and jigsaw puzzles to teach communication skills and language arts to kids as well as adults is fueling the growth of this segment in the global market. Among the games and puzzles, the tabletop games, also known as board games, are the largest selling variants. The growing demand for different variants of tabletop games will encourage the vendors to launch a wide product portfolio in the global toy market. In the market, pre-schools kids are more interested in chance-based tabletop games and puzzles based on animated characters. The growing popularity of strategy-based games among grade-schoolers, teenagers, and adults will contribute to the growing revenues in the global market. The increasing demand for dice games such as Yahtzee, Bunco, Shut the Box, and Lair’s Dice and for card games such as Yu-Gi-Oh, Uno, Spades, and Poker,and Taboo will add to the revenues in this segment in the global toy market. The age group segment in the global toy market is segmented into 0-3 years, 3-5 years, 5-12 years, and 12-18 years. 5-12 years segment occupied around 1/4th of the market share in 2017, growing at a CAGR of around 5% during the forecast period. The toys designed for 5-12 years age group comprises of games and puzzles, construction toys or building blocks, some outdoor and sports toys, and other toys. The growing popularity of licensed toy properties, remote controlled toys including cars and musical toysis propelling the growth of this segment in the global market. The increasing focus on safety and entertainment requirements will lead manufacturers to launch varied products in the global toy market. Companies such as LEGO are designing built toys and building systems for different age groups with varied functionality to boost skill development and thinking abilities in kids particularly for this age group in the market. APAC, owing to its sheer size of the population and potentially the largest end-user base for toys designed in the age group of 5 to 12 years in the market. These dynamic factors are contributing to the development of this segment in the global toy market. Order a report, for more information. The global toy market by geography is divided into APAC, Europe, North America, Latin America, and MEA. Latin America is the fastest growing region in the global market, at a CAGR of approximately 8% during the forecast period. The unprecedented popularity of branded, as well as private label toys, is fueling the growth of the Latin American region in the market. The steady increase in the per capita disposable income of people will contribute to the revenues in the region and the global toy market. Various domestic vendors publish the translated version of internationally recognized games and puzzles to gain a large number of consumers in the Latin American market. The increasing awareness about the toys and games through social media will help in the expansion of key vendors in the Latin American market. Also, the increasing number of internet and smartphone users will lead Latin America to occupy a sizeable global toy market share over the next few years. The geographical segment in the global toys market is classified into APAC, Europe, North America, Latin America, and MEA. APAC occupied more than 1/3rd of the total market share in 2017, growing at a CAGR of around 5% during the forecast period. The rapid urbanization and increase in spending capacity are major factors propelling the growth of the APAC region in the global market. Dolls, construction toys, and toys for infants and preschool children are the largest selling products in the APAC market. China, Japan, South Korea, Thailand, and India are the largest revenue generators in the APAC market. Various multinational brands and manufacturers are expanding their businesses and distribution networks to meet the growing consumer demand in the APAC market. The implementation and adoption of new technologies by manufacturers will revolutionize the APAC market over the next few years. The enhanced spending sentiments because of the economic recovery will boost the demand for the toys in the US region. The global toys market is highly concentrated, and the top 3 players control the level of the competition. The leading manufacturers are leveraging advanced technologies to refine their unique value proposition and gain a larger global market share. Various international brands are partnering with local, regional players to expand their businesses in emerging nations across the world market. The leading companies are utilizing factors such as smartphone proliferation, nuclear households, and humongous amount of targeted media content to advertise their products and reach a wider consumer audience in the global market. Moreover, the inclusion of technological developments such as immersive experiences of virtual and augmented reality will have a positive impact on the global toys market. Other prominent vendors in the global toys market are Asmodee, Ravensburger, Funskool, Top Toy, K’NEX, Playmates Toys, Simba Toys, Spin Master, CMON, Disney, Fremont Die Consumer Products, Games Workshop, Goliath, Grey Fox, IELLO, Indie Boards and Cards, INI, International Playthings, Learning Resources, Loony Labs, Ludo Fact, Melissa & Doug, Orchard Toys, Panda GM, Paul Lamond Games, Pegasus Spiele, Piatnik, Pressman Toy, Roosterfin, Reaper Miniatures, Rio Grande Games, Schmidt Spiele, Surprised Stare, SunOut, Talicor, The Haywire, The Regency Chess Company, ThinkFun, TREND Enterprises, Ultra PRO International, University Games, USAopoly, Winning Moves Games, WizKids, and Zobmondo. 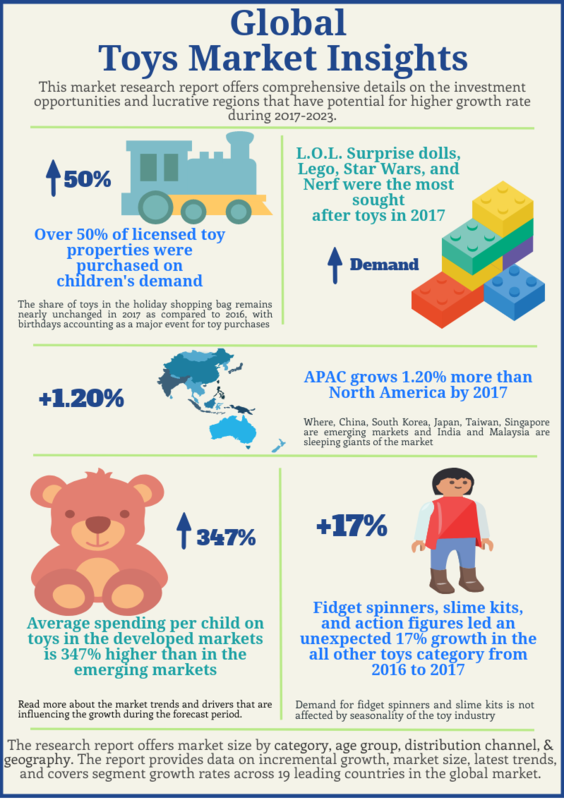 The complete overview of the latest market research report on the global toy market by Arizton is now available.